The web has made it extremely easy for us to provide a variety of information. Billions of blog posts and videos are on the web. It is fair to say that we are in the Information Age. Millions of people realize the power of content on the web, and many of these people scramble to add content to their social networks, blogs, YouTube videos, and products. Most people have the belief that the content needs to be different on each blog and social network you have. However, there can be repeats. In fact, many entrepreneurs and bloggers repeat themselves. Take, for instance, the New York Times bestselling author who goes around the country talking about her book. Some public speakers have been using the same speeches for decades. The reason so many public speakers make the same speeches is because the message still works, and not everyone has heard it yet. The same idea can be applied to content on the web. 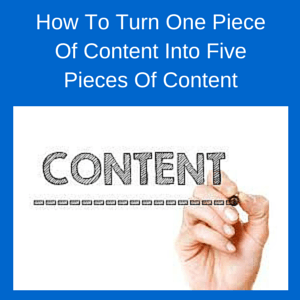 Believe it or not, there is a way to turn one piece of content into multiple pieces of content, even if the message is the same. Below are five pieces of content you have at your disposal. The next time you write something, know that it can become one of these five things, or even all five of these things. Most people who think of putting content on the web think of blog posts. The advantage of writing your own blog and publishing blog posts there is that your blog is your home on the web. While social networks contain distractions (i.e. someone else’s Facebook post may be more interesting, a trending topic on Twitter must get clicked on), your blog only contains your content. With that said, putting advertisements on a blog would be a big mistake, but before I go too far off tangent, I’ll come back to the point of this article. If you optimize your blog to make people stay on it longer, and you have it optimized to get more subscribers, your email list will grow. Your email list is a crucial element of your online success, and some marketers go as far to say that the money is in the list. Valuable blog posts will provide as a strong incentive to get more subscribers, and if you write blog posts every day, they will become fun to write, regardless of what type of a writer you are. I used to hate writing, but now I can’t imagine a day when I didn’t write something. After you write a blog post, you can create a YouTube video about that exact blog post. The best part is that the script is already written for you. You can simply read your blog post word for word or make slight changes that let people know they are still watching a video (if your blog post says, “in this post,” say “in this video” instead). Since you have all of the scripts in front of you, creating your own YouTube videos will get easier. If you write a great blog post, then all you have to do is read that blog post, have a professional picture of yourself that people see for the entire video, and then you have a YouTube video. Your YouTube channel can lead to more blog traffic. Promoting your blog on YouTube is a great way to boost that blog’s SEO, and if you include your blog’s link in every video description, some of your viewers will click on the link and read your blog’s content. In the scenario of turning one piece of content into multiple pieces of content, podcasting is very similar to creating a YouTube video. All you do is read the blog post you wrote and then put the recording on your podcast. As you add more recordings to your podcast and start to turn it into an authority, you can interview experts in your niche. That way, your podcast will be associated with the most successful influencers in your niche, and you get to learn more about your niche at the same time. If you already wrote numerous blog posts, you can turn a collection of those blog posts into your own book. That way, instead of writing a new book, you can use your old content, have another book for the world to see, and then you will make more revenue. The tricky process of using blog posts to write your own book is to make sure the dedicated readers of your blog don’t feel cheated. It is hard to make someone not feel cheated if they have to pay for content that they can legally access for free on the web. Luckily, there are ways to give your readers value even if the content is already available on your blog for free. The first way to make your readers happy to buy your book with your blog posts is by making your book organized. Most blogs, even the ones that are high value and focus on a specific niche, are knots of information. Sure, there are categories, but on most blogs, it is difficult for a visitor to find a series of blog posts that all have the exact information that visitor wants. When you write your book, you can arrange your blog posts in a way that allows one blog post to lead into the next blog post. The second way to increase your book’s value is by providing content that can’t be found anywhere else. You can call these the bonuses or the lost blog posts that never got published (and were then found). Your most loyal readers may buy your book just to get access to the lost blog posts. My recommendation is to have a few thousand words of content exclusive to the book itself. In a training course, you have the option to include PDFs and videos. That means in a training course, you have the option of using pre-published content from your blog, YouTube channel, podcast, book, or any other content that you have pre-published. My recommendation is to make anywhere from 5-20% of your training course consist of pre-published content. Since training courses are priced far above books (the $10 book vs the $100 training course), most of the content you put on your training course needs to be new content. The great thing about putting pre-published content on your training course is that you can promote yourself. Several marketers throw in some of their YouTube videos in the bonus section because the people who like the YouTube video may decide to take a look at the marketer’s channel, and some people will even subscribe to that channel. The same can happen if you choose to promote your blog posts, podcasts, and a free sample of your book. Your customer will also feel as if you over delivered because if the customer subscribes to your YouTube channel that gets updated weekly, then your customers will see all of your YouTube uploads as bonuses. They may have went to your YouTube channel after watching one YouTube video, and then, there are 50 videos for your customers to watch. I consider these as bonus videos for the public. You will even make additional revenue when someone clicks on an Adsense ad in your video or waits for the five second ad to go away. Just because you publish a piece of content somewhere on the web does not mean you can repackage that content somewhere else. I turn several of my blog posts into YouTube videos, include 1-2 of my blog posts in some of my books, offer free samples of one of my books in my training course, and when I start my podcast someday, I imagine the same process trickling into that area. What are your thoughts on repackaging your content into other areas? Do you already repackage your content into other areas on the web? Please share your thoughts and advice below.